While browsing through for ideas for sides with grilled shrimp, I found an elegant meal served by Ina Garton of Barefoot contessa fame. The combo looked perfect and so here It is. I made several changes in the saffron rice recipe and am sure you all will love this version. 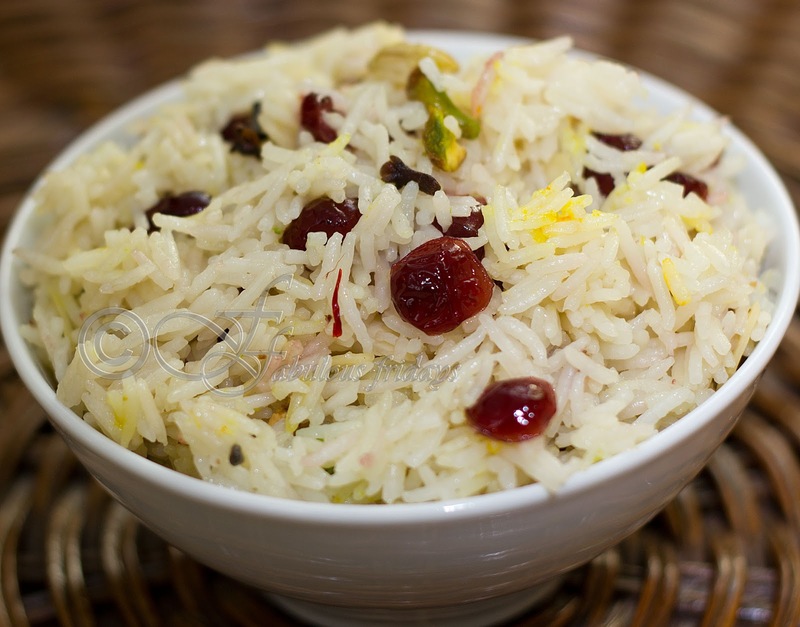 It kind of evolves from the pilaf recipes of the Mughlai cuisine, and goes very well with shrimp. This rice can be served with any BBQ meats such as Cedar wrapped salmon , Malai chicken tikka , Tandoori chicken , Grilled red snapper , Stuffed chicken breast and grilled Tilapia. To avoid the flavour competition, I kept the shrimp and asparagus fairly simple. Wash rice and drain the water. In a heavy bottomed pan heat ghee and add cardamom, cloves, cinnamon. stir for 10 seconds and add rice along with zest and cranberries. stir to coat the rice with ghee and spices. Add water and salt. mix well. Add the saffron threads soaked in milk. Stir well if you want the entire rice to turn yellow OR just give it one random stir to get the effect you see in the picture. Bring to boil. Cover and simmer for 10 minutes till rice is cooked through and all the water is absorbed. 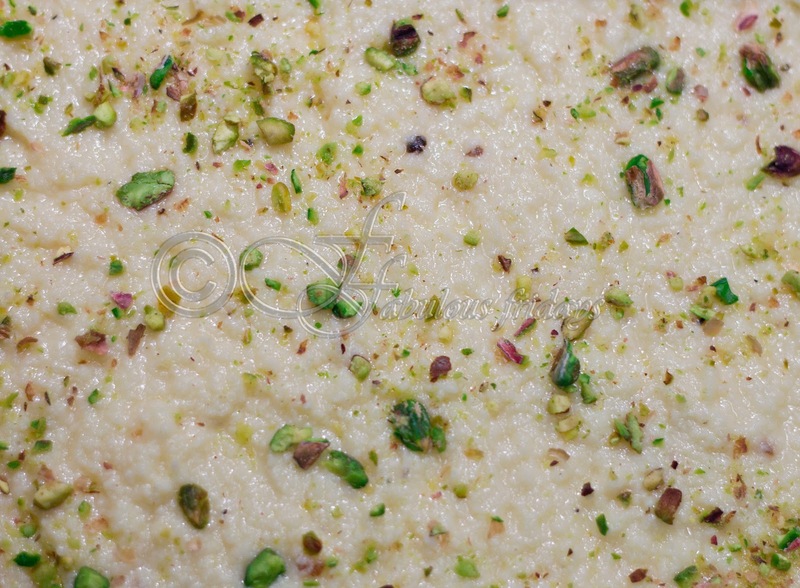 Remove from heat and stir in the almonds and pistachios. Drizzle asparagus and shrimps with olive oil and season with salt, pepper and sprinkle parsley on top. 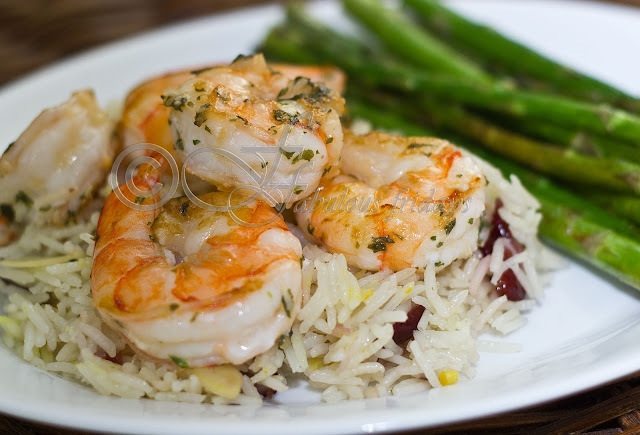 Add grated garlic to the shrimp and mix well. Place asparagus in a single layer on the preheated grill on high. It will take about 15 minutes for them to grill. Turn after 7 minutes. At this point place the marinated shrimps in a single layer. 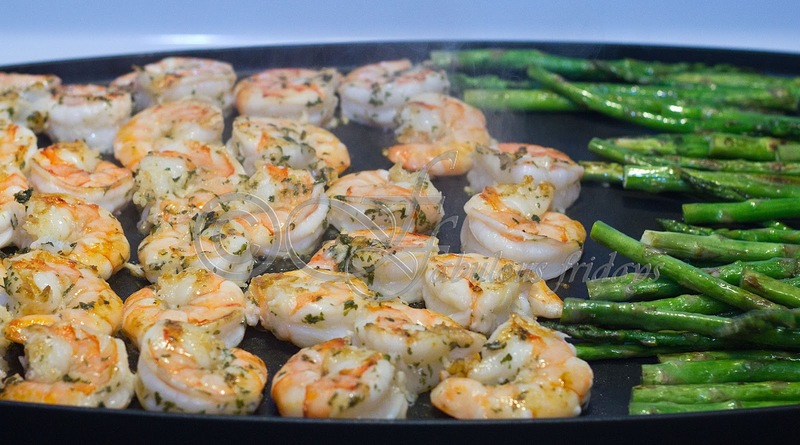 Shrimps will cook way faster than asparagus so time accordingly. Roast shrimps for about 4-5 minutes per side (will need less time if shrimps are smaller in size) till they turn pink. Roast asparagus till it wrinkles a bit. 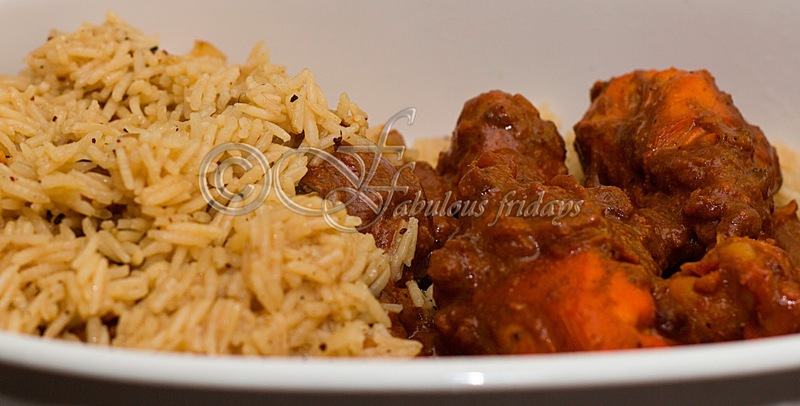 Serve on a bed of saffron rice. These rich and decadent bite sized chocolates are a fave of all chocolate lovers. A French invention of the seventeenth century, the original chocolate truffle was a ball of ganache (smooth and velvety mixture of chocolate and cream), flavored and rolled in cocoa to simulate the 'dirt', real truffles grew in. Hence named 'Truffle' after the precious black truffle fungus. 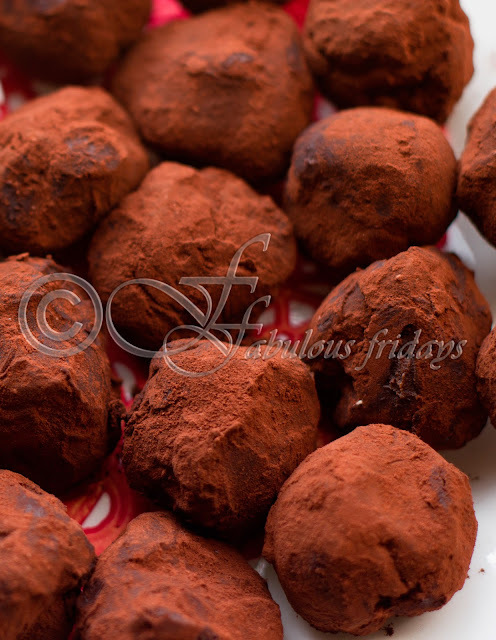 The real taste of a chocolate truffle depends largely on the quality of chocolate used in the recipe. Not all cooking chocolates are created equal. Factors such as level of toasting of the cocoa beans, amount of cocoa butter added, its final texture, etc. all affect the taste and quality of the final product. 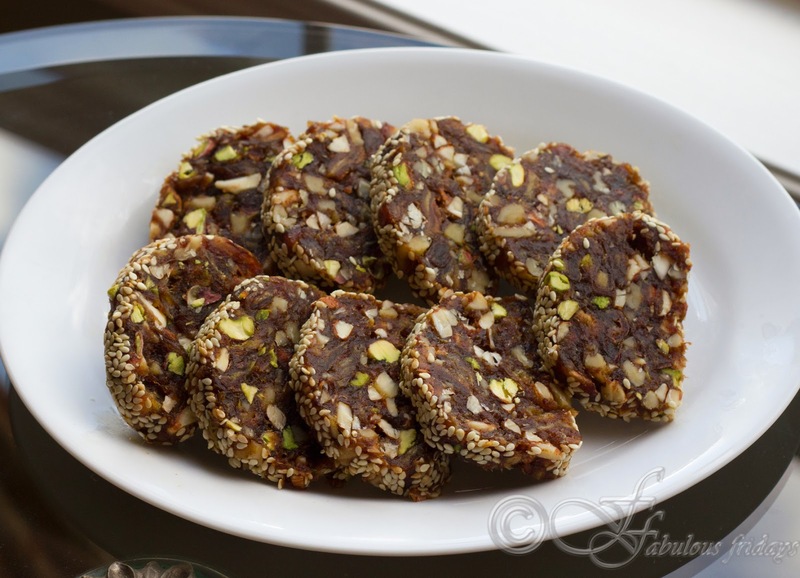 Before you start making these yummylicious delights decide on type of chocolate you will use. As per your taste you can choose between semi sweet or bitter sweet chocolate. Choose between cocoa powder, shredded coconut, toasted chopped nuts, powdered sugar dusting, crushed peppermint candy or chocolate shavings as coating. 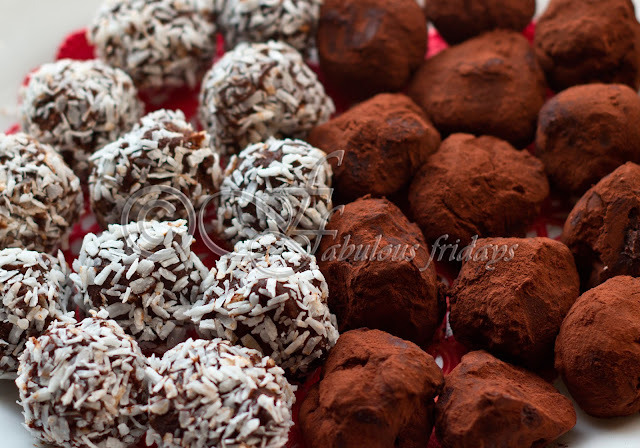 Truffles can be flavored with addition of rum, cognac, brandy, frangelico, bourbon, etc. In a small saucepan bring cream and butter to boil. Remove from heat and add chocolate. Stir till it completely melts and combines with the cream mixture. If using, mix in the liqueur. Cover and refrigerate till firm. This could take a minimum of 4 hours or more. Place the coating in a deep bowl. With your hand or a melon baller scoop out small bite sized balls. Roll them on the coating and place on a parchment paper lined container. Refrigerate till firm. Make sure you touch them with your hand as less as possible as this will melt the chocolate. 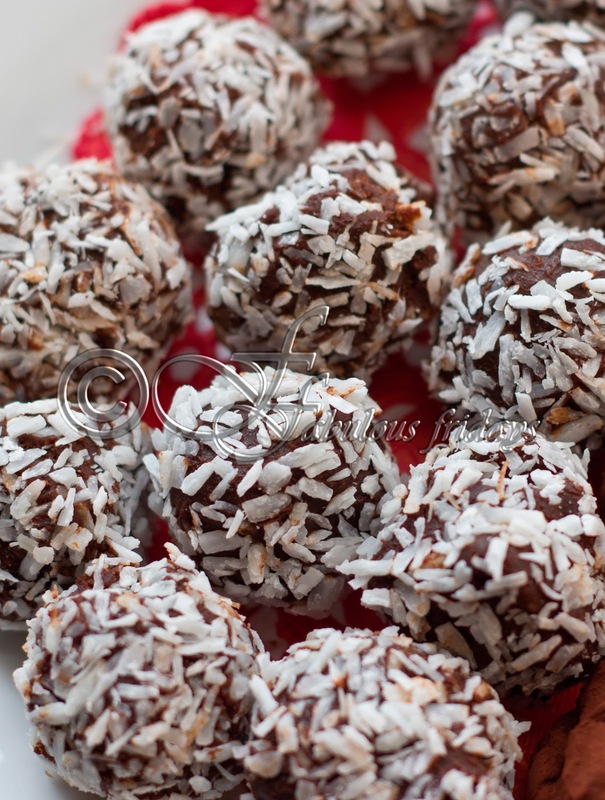 Best to make irregular sized truffles. 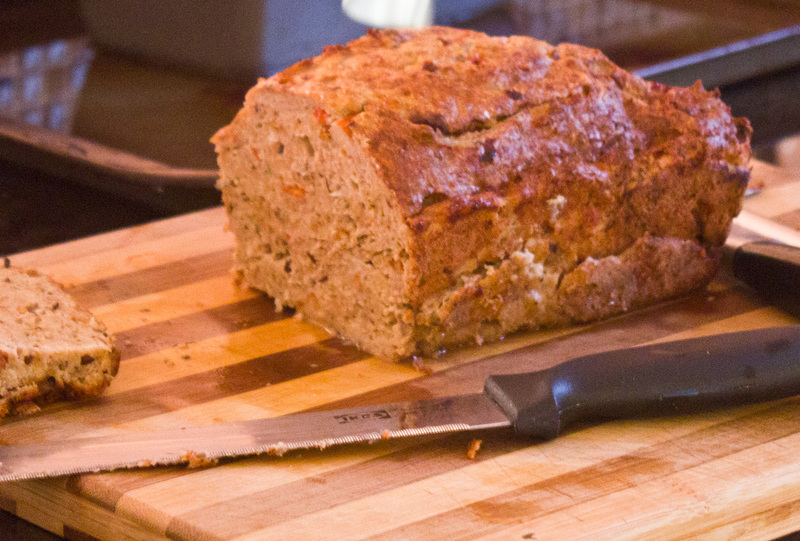 Can be stored at room temperature in an air tight container for a 4-5 days, or refrigerate for up to 2 weeks. Dum pukht cooking (cooking with steam) has been a favourite of the royals since it travelled with the Mughal to India from the Middle east. 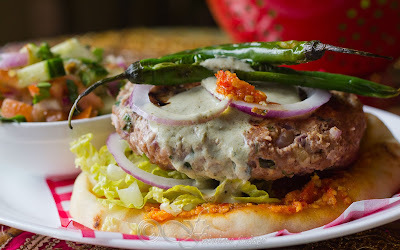 Known as the food of the nawabs, it became popular in the courts of Awadh, Hydrabad and Kashmir, each giving its own twist. The essence of dum pukth lies in its aroma, where meat rice and vegetables are allowed to infuse in rich spices by cooking them on a very slow flame in a copper or earthen pot covered with dough. This purdah (veil) style of cooking seals the pot with the dough allowing the food to cook slowly in its own juices and infusing the flavour all over. These dishes use a generous amount of ghee and are elaborate to make. You can use either lamb or chicken, preferably with bones. Traditionally the dough is made of wheat flour, ghee and sugar. 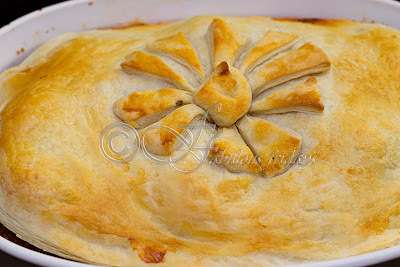 But its easier to use puff pastry as it saves a lot of time and tastes crisp, flaky and wonderful. Clean the chicken and pat dry. Give it several slits to allow good marination. Make the marinade by combining half the yogurt with 1 tsp ginger garlic paste, tandoori masala and salt. 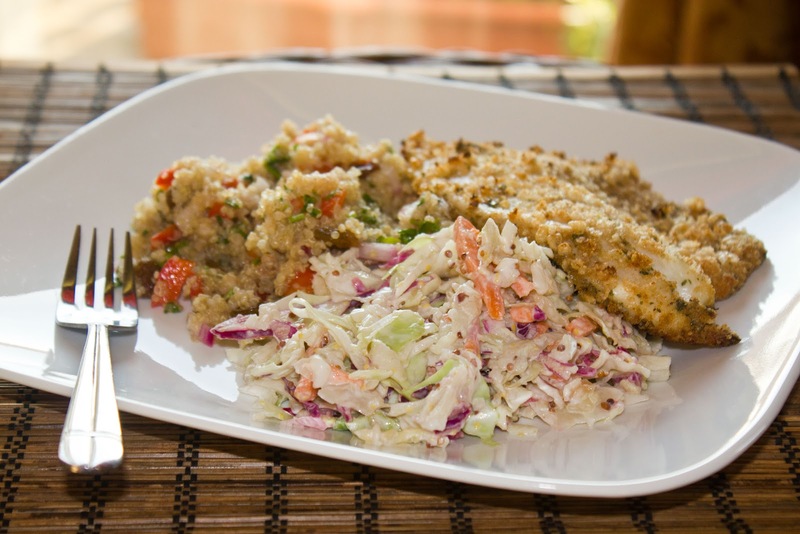 Mix with chicken and refrigerate to allow marination for a minimum of 4 hours. In a pan sauté the onions till they are golden brown. Keep aside. Wash and drain the rice. In a pan heat 1 tbsp oil and add a third of the coarsely ground dry spices. Let them spatter for 3-5 seconds. Add rice and sauté in the spices for a minute to coat each grain with oil and spice. Add 4 cups water and salt to taste. Bring to a rolling boil and simmer covered for 7 minutes till rice are two thirds done. Meanwhile cook the chicken. In a large pan heat 2 tbsp oil and add the remaining coarsely ground dry spices along with kasuri methi, mint leaves and red chili powder and the marinated chicken. Cook on high stirring frequently till the chicken no longer looks pink, about 7 minutes. Add tomato and remaining yogurt along with salt and continue cooking on high till oil starts to leave the sides of the chicken. Layering - Grease a large oven proof dish and start layering the rice and chicken in alternate layers. Cover the pan with rolled out puff pastry ensuring all edges are sealed. 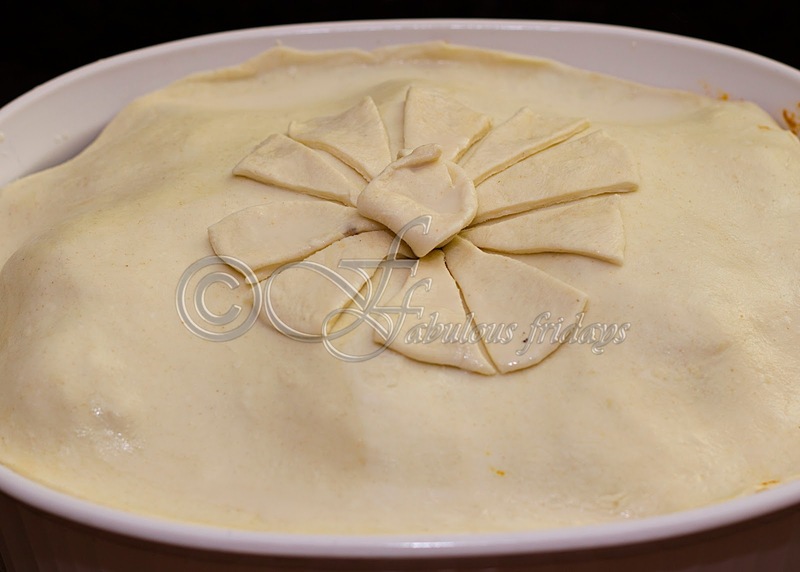 Place in a preheated oven at 350 F for 30 minutes till the pastry is golden and crisp on top. Dig out the yummylicious chicken infused rice along with a portion of the crisp dough and enjoy with raita and green salad. 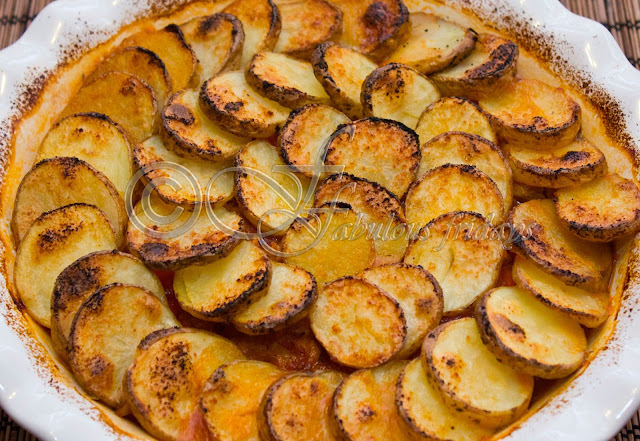 As cold weather sets in warm hearty casseroles are a way to go. This pie is almost a complete meal in itself. Add lots of veges to the meat to make it more hearty. I used small white potatoes with skin on. You can use red potatoes or even russet potatoes peeled and sliced. Serve with green salad or crisp green beans and some crusty bread to dunk the meat. Boil potatoes till they are three quarters cooked. slice them into even thin rounds. Season them with salt and pepper and keep aside. In a pan heat 2 tsp oil and cook onion and half the garlic for 3-4 seconds. Add mince chicken and sauté till it is no longer pink. Add tomatoes and carrots and cook on high for 2 minutes. Mix cornstarch in the chicken stock and add to the pan along with herbs ans seasoning. Bring to a boil and simmer for 3-4 minutes. Grease a shallow pie dish and transfer the cooked chicken to it. 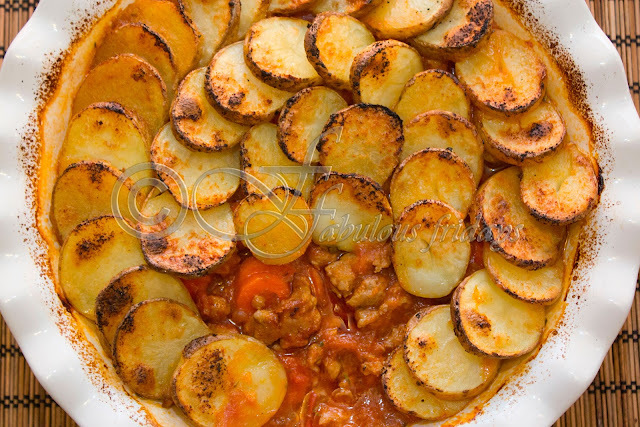 Layer the potatoes on top of the meat mixture. Make a mixture of 2 tsp olive oil and rest of the crushed garlic and brush liberally over the layered potatoes. 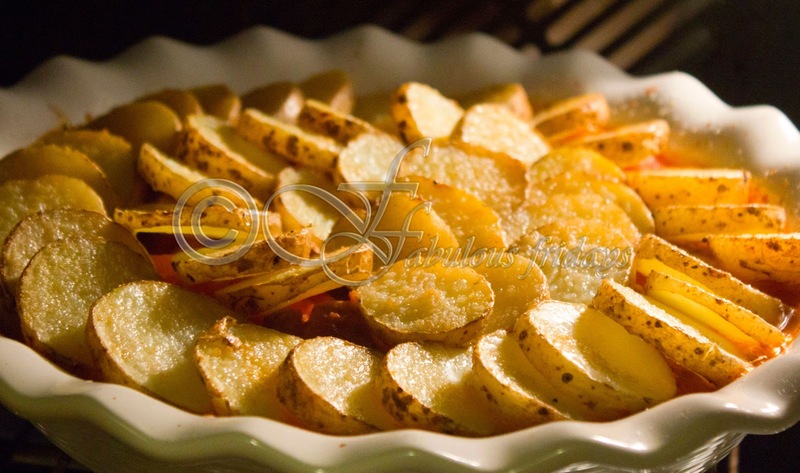 Cook in the preheated oven for 30-40 minutes till potatoes are tender and golden. 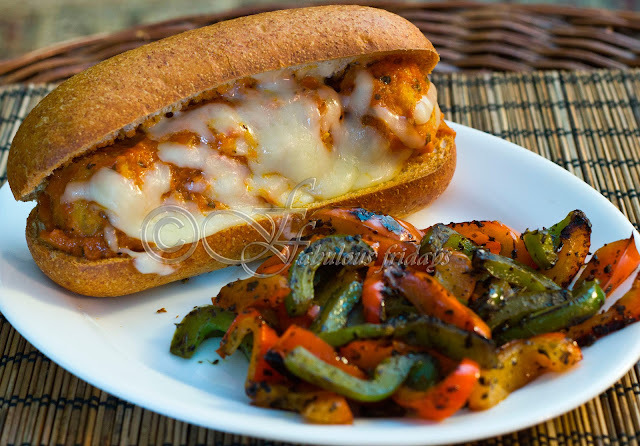 Robustly flavored meatballs and a hearty tomato sauce makes for a wonderful sandwich filling. And if you top it with melted cheese then it becomes heavenly. During the chilly months try this hot sub sandwich instead of cold cuts. 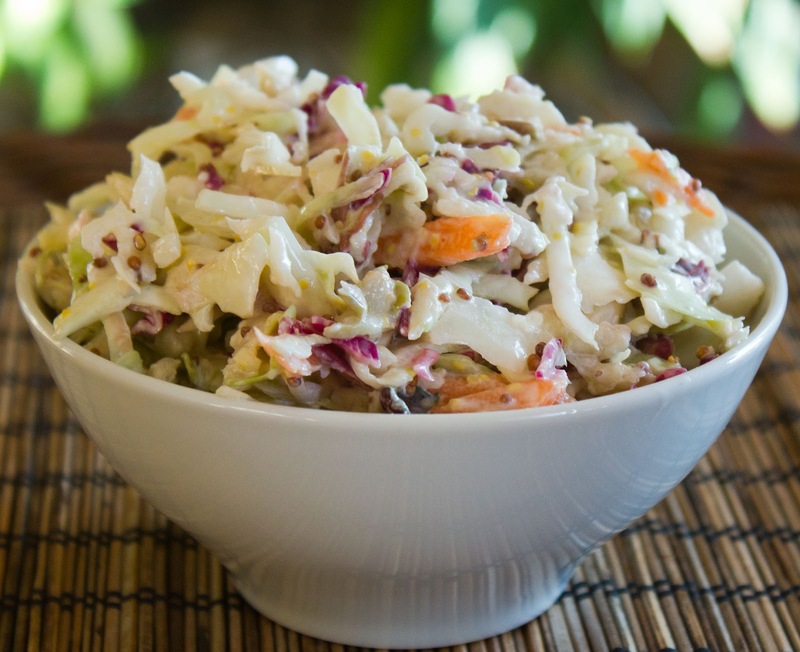 Pair it with grilled veges, oven fries or a crunchy coleslaw. 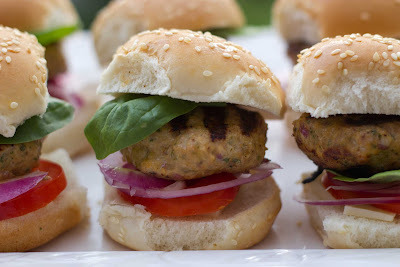 These are great for entertaining, use mini burgers and place one meatball with sauce topped with cheese for a 2 bite sub. Kids will love this too. Meatballs can be made in advance and frozen. Combine all the ingredients in a bowl and mix with hand till well combined but not over mixed. Place them in a greased baking sheet, spray with a little oil and bake for 15-20 minutes till golden brown and cooked through. Keep aside. Heat oil in a pan at medium heat and add onion, garlic, crushed red pepper and dry herbs. Cook till onions brown a little. Add tomatoes and seasoning. Bring to a bubble and simmer for 15 minutes. Combine meatballs and marinara sauce. Pile them on to the sub rolls, at least 4 per roll. Top with shredded cheese and place them under the broiler for a few minutes to melt cheese. 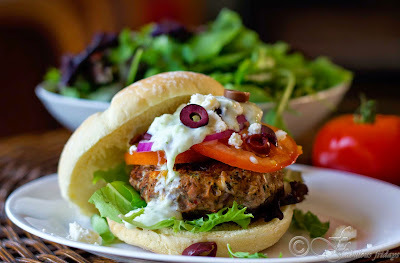 Serve with grilled multi colored peppers or Coleslaw or Funky fries. 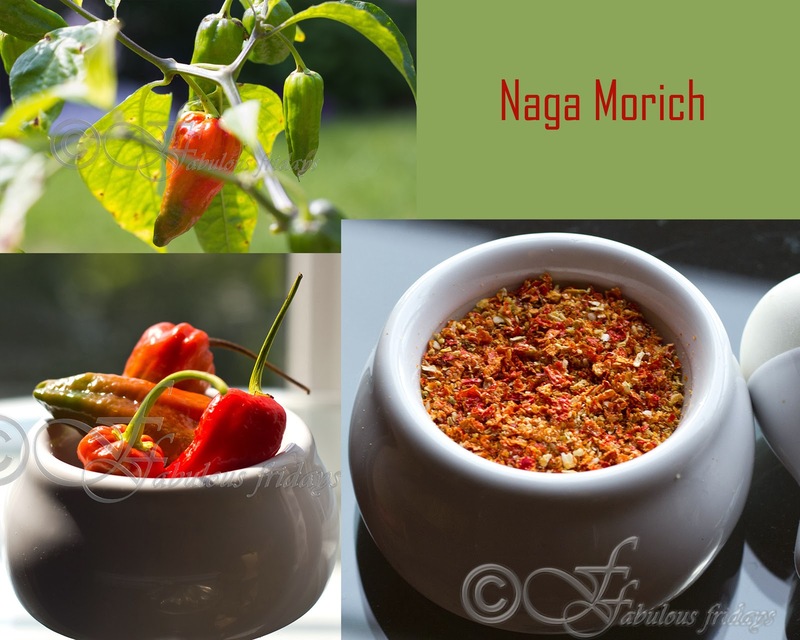 Naga Morich meaning 'snake or serpent Chile’ is an apt name for this ferociously hot variety of pepper. It is believed to be very closely related to its Indian cousin, the Bhut jolokia (Bih jolokia). In recent tests, one Naga Morich pod registered 1,598,227 Scoville units. I had 2 plants of this growing in my backyard and after sharing with neighbors and friends I ended up with a small jar of this firebomb. After harvesting I sun dried these for 3 weeks and then pulsed in my grinder. This will last me a whole year. 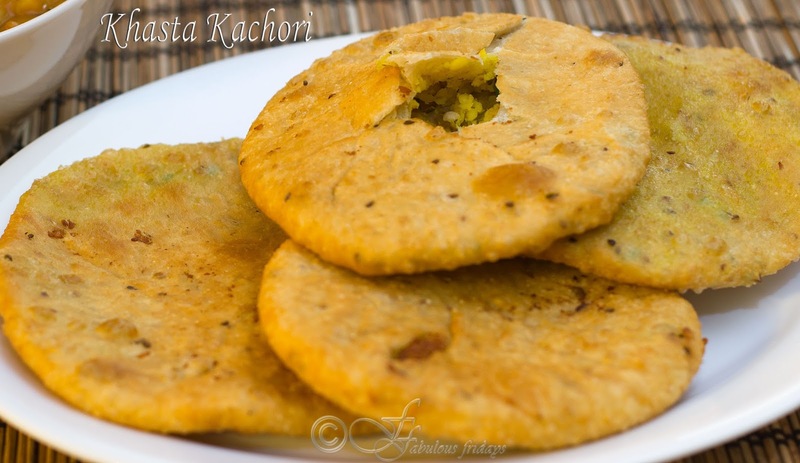 Khasta kachori is the essential hearty and heavy breakfast food of northern India, especially the streets of Uttar Pradesh. 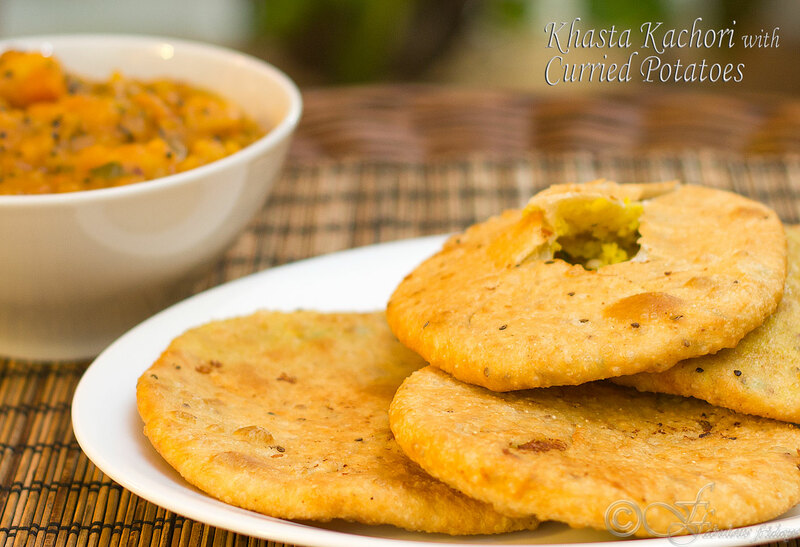 It is available at all halwai shops and street vendors in the mornings, enticing everyone with its rich and spicy aroma of deep-fried dough and hing tadka. 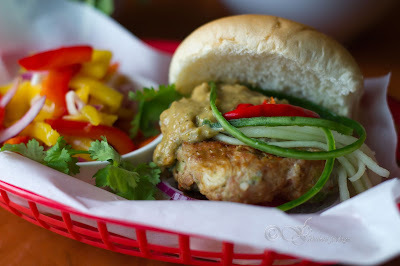 This dish is in the category of "make it once in a blue moon, or special occasions" in our house, yet it is so sinfully delish that I had to share the recipe with you. 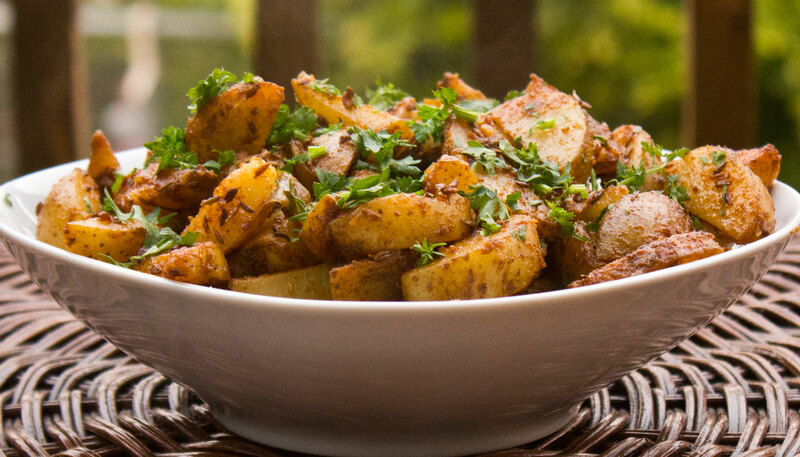 If you are having it as a meal then pair it with aloo ki subji with hing tadka (UP style). 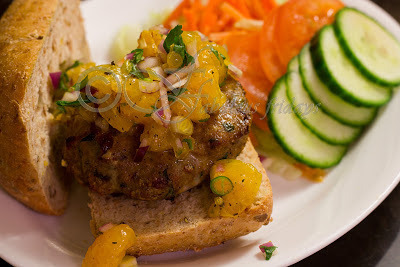 If you are indulging in it as a snack then pair with mango pickle or green chutney. 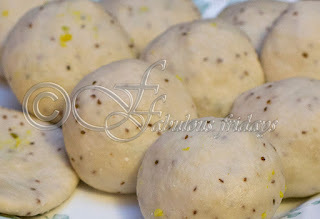 Make the dough - Take the flour in a bowl and add salt and ajwain seeds, mix. Add ghee and mix well so that the flour resembles fine breadcrumbs. Now use as little water as possible to make a stiff dough. Wrap in plastic wrap and keep aside for 20 minutes. Make the stuffing - In the meantime make the stuffing. Drain out all the water from the soaked dal and grind it coarsely in a food processor. In a dry grinder coarsely grind coriander seeds, cumin seeds, and fennel seeds. 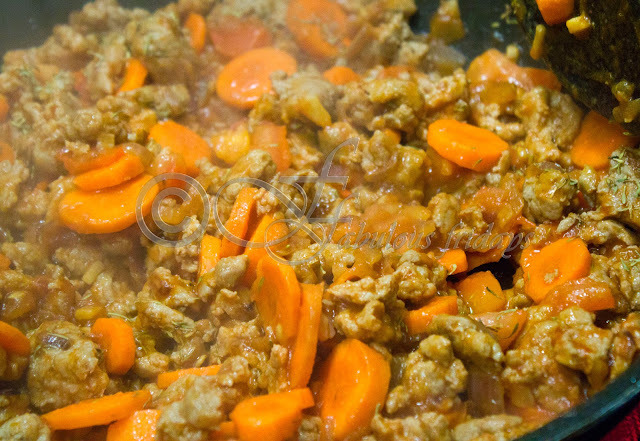 In a pan heat 2 tsp oil and add the coarsely ground spice to it along with asafoetida. Let them roast for 30 seconds. Add green chilies, ginger and ground dal. Mix well and reduce heat to medium. Add all the other spices and mix well. Cover and cook for 5-7 minutes stirring once in the middle till all the water absorbs and dal is cooked. Let cool and crumble all the lumps. Now we are ready to stuff the kachori. Heat oil in a deep pan enough to deep fry, to a medium-high heat. Divide the dough into 12 to 15 balls. Flatten one and roll into a small poori. 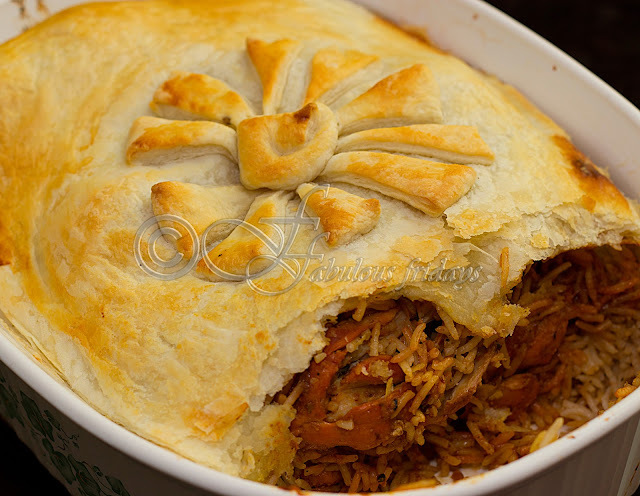 Place a large helping of stuffing in the center and seal it by bringing the edges together. Make it into a ball. Peel and boil potatoes. Roughly chop them and keep aside. Heat oil in a pan and add asafoetida and cumin seeds. Add the potatoes and all the spices and mix well to incorporate the flavor. Cook while stirring on medium heat for 2-3 minutes. Add puréed tomatoes and cook for another 4 minutes. Add 1/2 cup water and bring the whole concoction to boil. Simmer for 2-3 minutes till the desired consistency is achieved. Dates are a great way to lower the fat content in any dessert. Along with being a good source of iron, they provide a buttery texture when cooked. 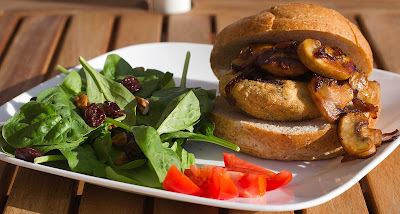 This vegan recipe is oh so simple and quite healthy. You really don't miss anything in this. Make sure to add all four types of nuts as they all contribute greatly to the flavor. Sesame seeds give it that hmmm.. touch. 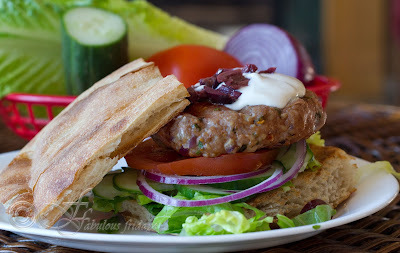 Some people make this recipe by putting all the ingredients in a food processor and making a smooth textured mixture. I like the chunky texture of dates and nuts and so I avoid using the processor. Chopping and cooking the dates in a small amount of water makes it easier to shape the log and incorporate the nuts. Try either way and find your favorite method to make them. These rolls look fabulous and taste even better. A must try. 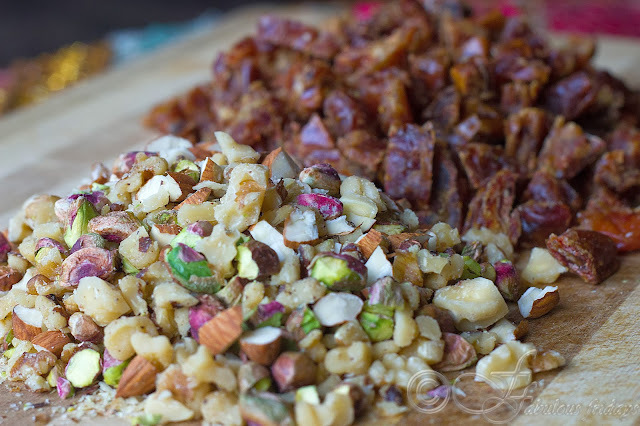 Chop nuts into small pieces and dry roast them for 1-2 minutes on medium heat. 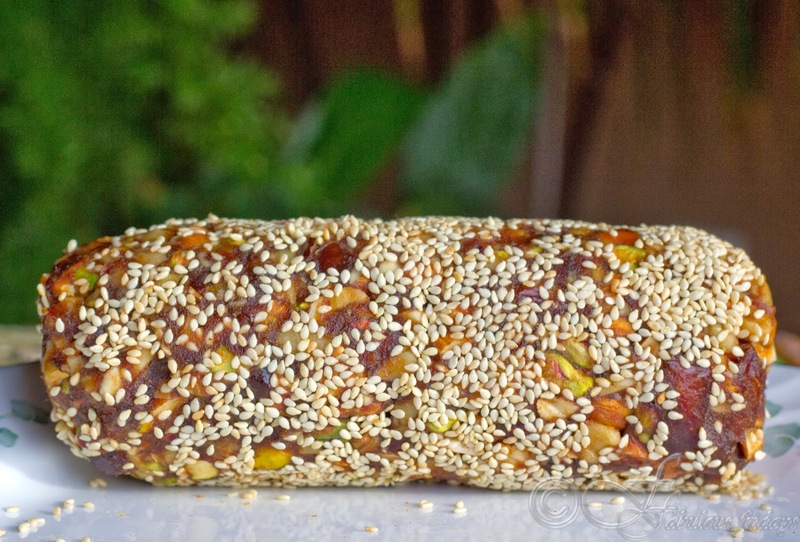 Dry roast the sesame seeds for half a minute and keep them aside. Heat a nonstick pan and add water and chopped dates. Stir fry the dates crushing them with a wooden spoon on medium heat for 5-7 minutes. Do this till they become soft and pulpy. Take away from heat and add the nuts and mix them well. Remove this into a plate and allow the mixture to cool a bit (so you can manipulate it with your hands). Rub a little water in your palms and make a cylindrical shape out of the mix. Spread the sesame seeds on a flat surface and roll it in this. Cover with plastic wrap and refrigerate for one hour. Cut into round slices. Keeps well for several days in the fridge. 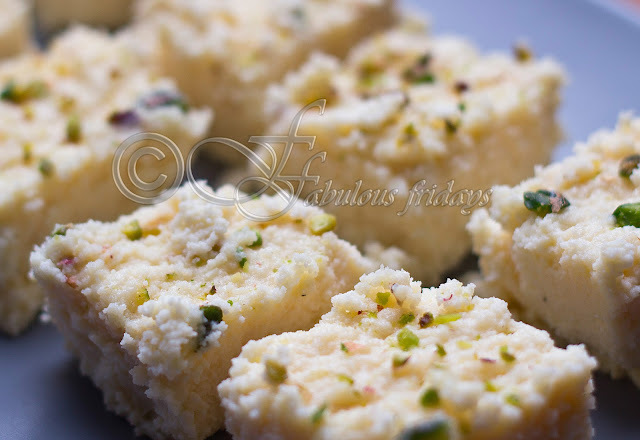 Kalakand is a soft,moist delicious dessert very popular all over India specially during festivals and celebrations. Traditionally its made by boiling milk down to half its volume and combining it with paneer or cottage cheese, a tedious and long process. But a much simpler microwave version of the recipe takes about quarter the time and comes out as delicious. I have written down both recipes and have also tried both. The results are almost same. 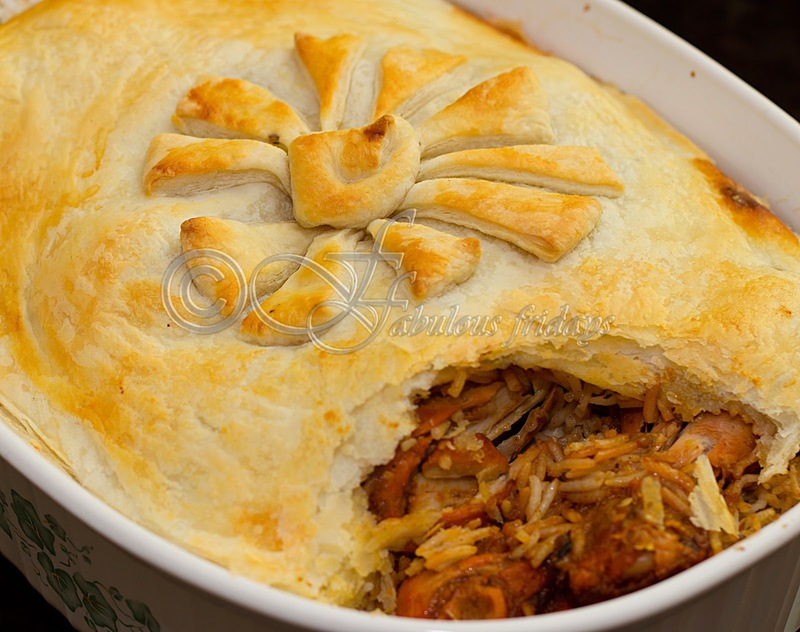 Try this recipe during the festive season this year and enjoy. Bring 1 litre of milk to boil. Add the citric solution as it comes to boil stirring constantly. Switch off heat once the paneer(curdled cheese) settles down. Sieve through muslin cloth, press out excess water, keep aside on a plate. Do not knead. Put the remaining milk in a heavy pan and boil till it reduces to half its volume. You have to be careful to not let the milk boil over or burn from the bottom. So after it boils, reduce heat and stir continuously. Once the milk reduces, add paneer and boil till the mixture thickens. Stir continuously. Add sugar and continue to cook, stirring all the while till it softly thickens into a lump. Remove from heat. Stir in cardamom powder. Pour the mixture in a greased tray, sprinkle chopped nuts on top and press them down to help them stick. Cover and allow to set either in the refrigerator for an hour or on the counter-top for a few hours. Cut into small squares and serve. In a microwave safe large dish, mix the Ricotta Cheese and the Condensed Milk well. Mash down all the lumps with a help of a whisk. Cook in the microwave for 5 minutes uncovered. Take out and mix well. Make sure that you loosen the edges. Back in the microwave 3 more minutes, uncovered. Take out and mix. Microwave for another 10 minutes, uncovered taking out and stirring every 2 minutes. Once done, mix well. Stir in the powdered cardamom. Pour the mixture into a greased tray. Press down and flatten the mixture. Sprinkle chopped nuts on top and press them down to help them stick. Cover and allow to set either in the refrigerator for an hour or on the counter-top for a few hours. Cut into small squares and serve. 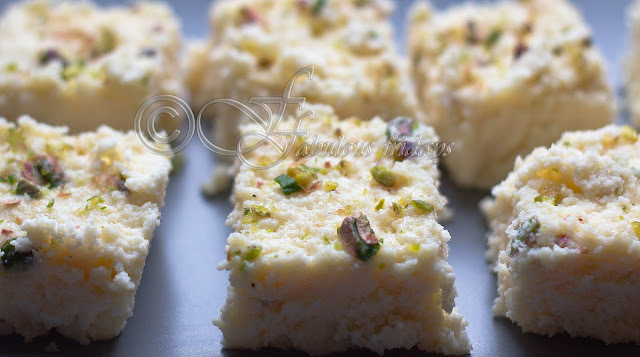 In a microwave safe large dish, mix theabove paneer and the Condensed Milk well. Mash down all the lumps with a help of a whisk. Cook in the microwave for 4 minutes uncovered. Back in the microwave 2 more minutes, uncovered. Take out and mix. Microwave for another 2-4 minutes, uncovered taking out and stirring every 2 minutes. 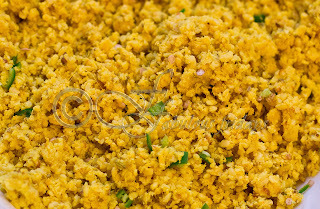 Upma is a hot breakfast food originally from southern India made with semolina. 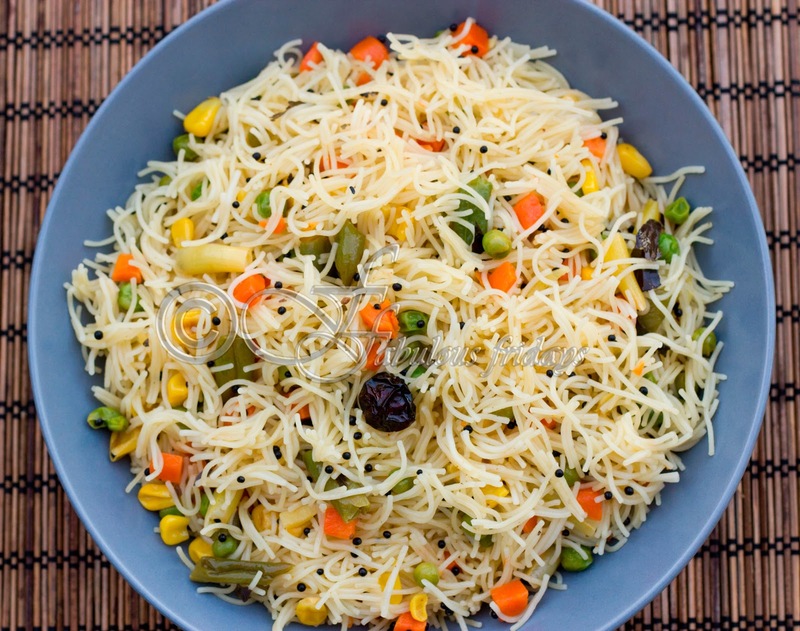 This recipe is a variation of the semolina upma and uses vermicilli or seviyan instead. Upma can be eaten for breakfast or lunch(as we do) and is a wholesome dish full of tonnes of veggies. 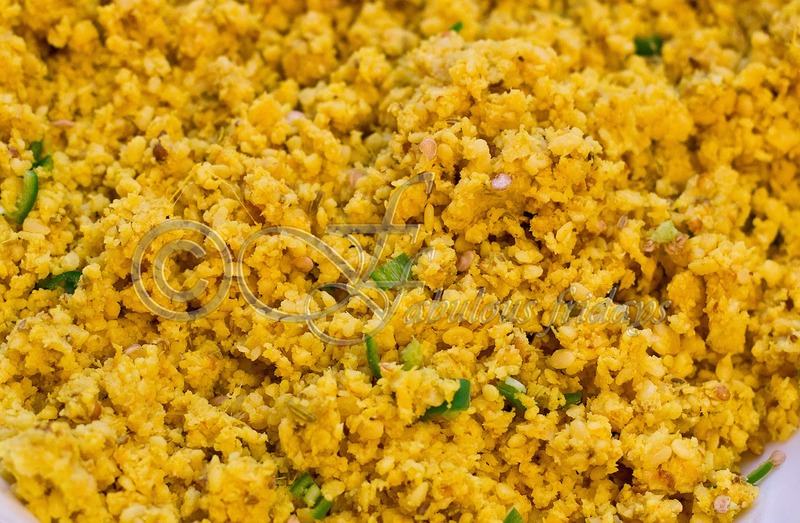 This version of upma is something that I make often. It requires very little effort and time and tastes delicious. Kids love it and enjoy it even in school (just omit the peanuts for a nut free version for school, instead use roasted chana dal). Heat 2 tsp oil in a thick bottomed pan. Add the vermicelli and shallow fry till golden brown, about 2 minutes, and keep aside. Heat rest of the oil in the same pan and add the mustard seeds. Once they crackle, stir in the asafoetida, urad dal, red chili, peanuts and curry leaves and fry for a few seconds. Add about 2 1/2 cups of water, bring to a rolling boil and allow the mixture to simmer for a minute. Add the fried vermicelli, mix and cook on medium high covered for 4-5 minutes, occasionally stirring to avoid burning. 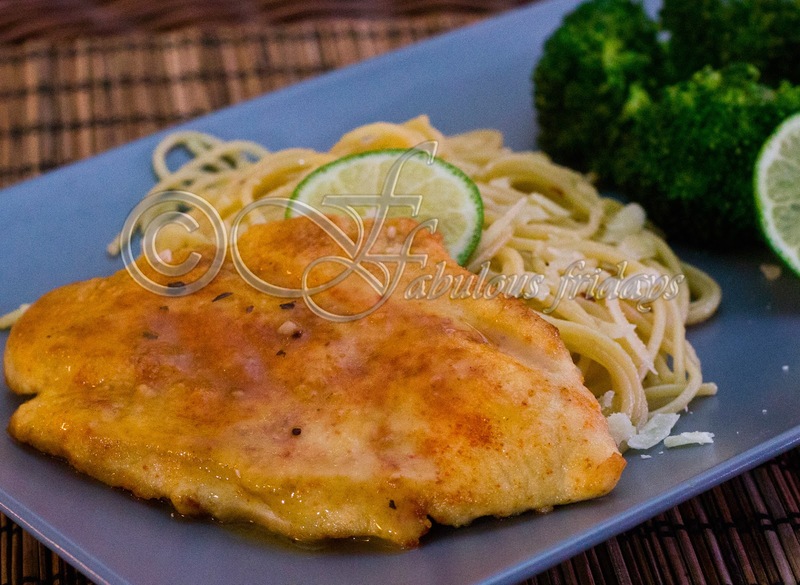 Chicken Piccata is a classic Italian dish served with a tangy lemony sauce. Slice the chicken breast and then flatten them between two sheets of plastic wrap to even out the thickness of the meat. This ensures even cooking all across. 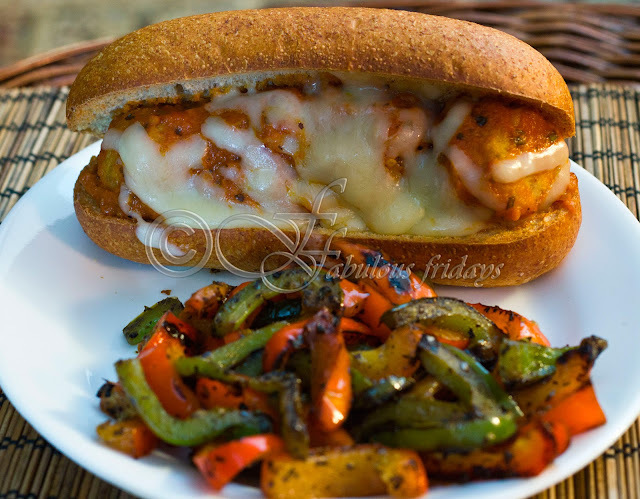 This can be served with rice or pasta as a side dish accompanied by a steamed vegetable. 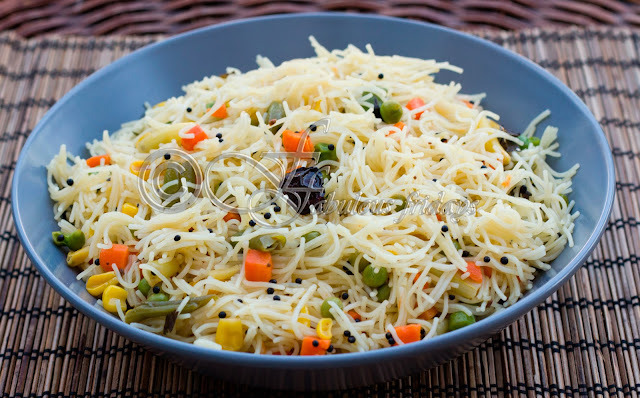 It tastes great with veggie rice and simple spaghetti tossed in butted and cheese. Season the chicken with with salt, pepper and paprika. Dredge chicken in flour and shake off excess. In a pan over medium heat, melt the butter with olive oil. Add chicken and cook for 3 minutes per side till chicken browns and cooks through. Remove chicken and keep warm. In the same pan, add lemon juice and stock and wine. Bring to a boil scraping all the brown bits from the pan. Return the fried chicken to the pan and simmer for 3-5 minutes. 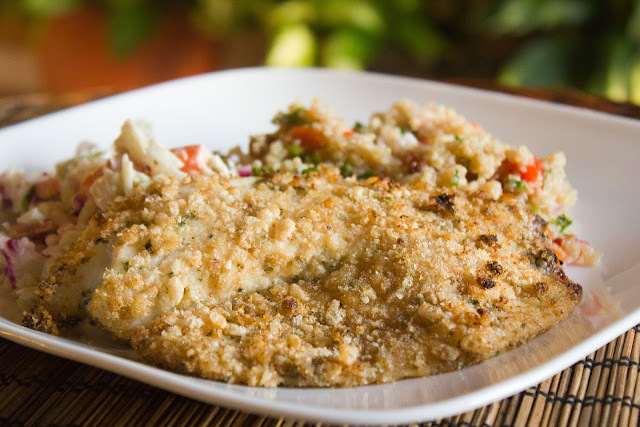 Serve drizzled with the lemon sauce and sprinkled with parsley. Gently coat the pasta with the butter mixture. Sprinkle black pepper and grated parmesan and serve immediately. Fasting is a spiritual practise observed in many religions. 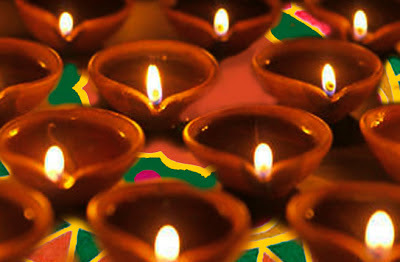 In Hinduism fasting stands for denial of the physical needs of the body for the sake of spiritual gains. By this act of self discipline devotees starve their senses (since food means gratification of senses), strengthening their mind as well as hardening their body for hardships. It helps establish a harmonious relationship between body and soul. During the Navratri festival a lot of Hindus observe eight days of fasting. Fasting can be of several types. Complete abstinence is called upavaas, avoiding any cereal and only eating fruits and root vegetables is called phalahaar. For navratri its mostly phalahaar. People eat only once in the evening and consume no cereal even in that meal. 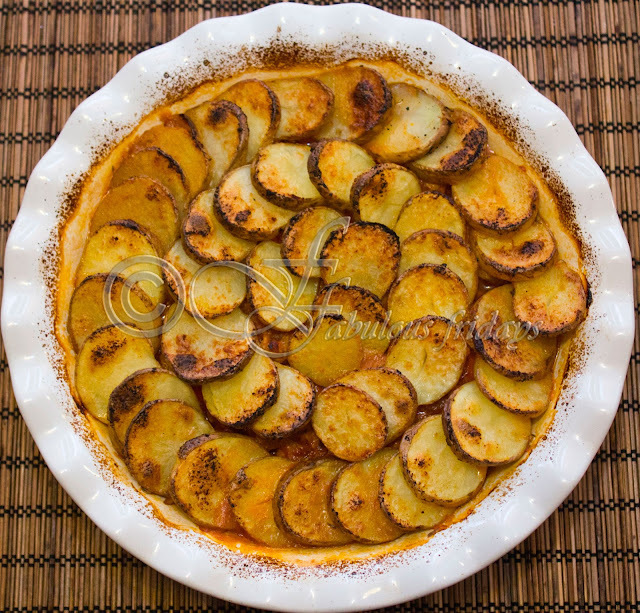 Potato is a popular choice for such meals and is prepared in several ways. Another favourite is fruit chaat, which is a blend of chopped fruit flavoured with salt and lemon juice. For those of you who are fasting, here are some recipes. On the eighth day devotees break their fast and worship little girls (between the ages of 2-12) as the goddess herself by offering poori with halwa and chane along with some little gifts and/or money. Add coriander, salt and cracked black pepper to taste. Mix well. Banana, apple, pear, grapes, oranges, pineapple, any fruits you might want to add. 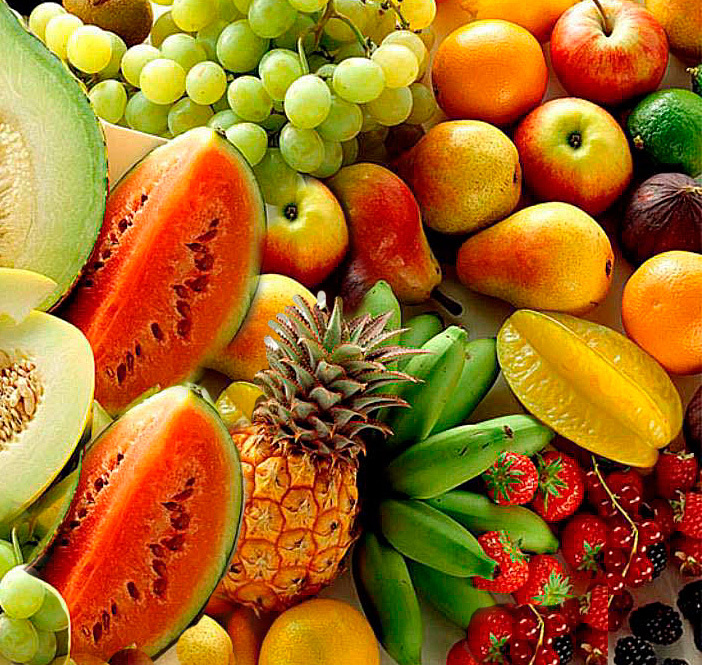 Some versions also add boiled sweet potato and cucumber to the fruit salad. Cut fruits into bite size pieces and combine in a large bowl. Flavour with lime juice, kala namak , freshly ground black pepper and dry roasted cumin powder. Mix well and refrigerate. Serve chilled. Prepare salsa - lightly sauté garlic and onion in a tsp olive oil till pink. Add chopped tomatoes and season with salt and pepper. Bring to boil and simmer for 10 minutes. Cool. Divide it into 2 portions. 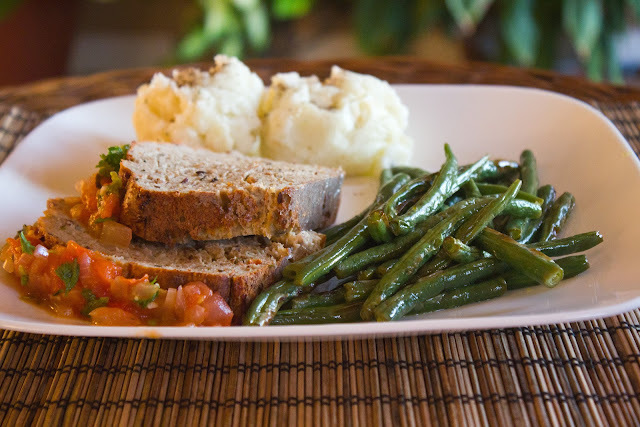 Combine all the ingredients for meatloaf with 1 cup salsa and place the mixture in a greased loaf pan. 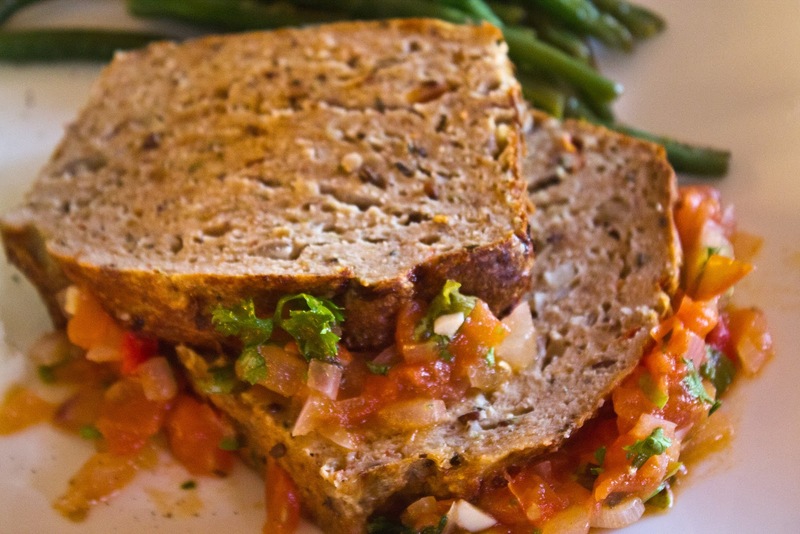 Bake at 375 for 55 minutes, Spread the remaining salsa over loaf and bake for a further 5-7 minutes. Let stand for 10 minutes before slicing. Yields about 12 slices. Boil the potatoes till tender. 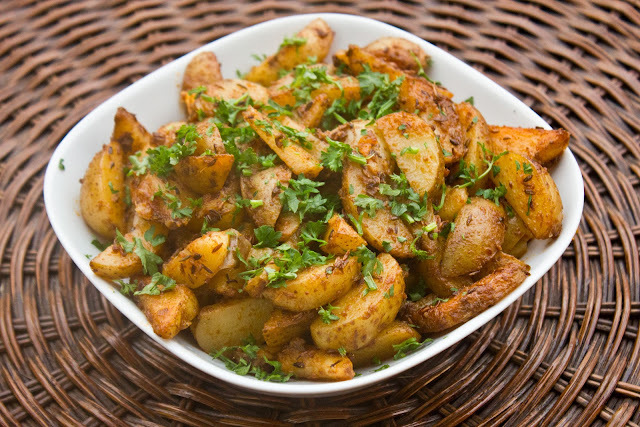 Drain and peel the potatoes and place them along with garlic in a large bowl. Mash well till potatoes are creamy and lump free. I like to pop this under the broiler for 5-7 minutes to give a slight texture and colour on top. Wash and dry the beans. Trim the ends. Mix all the ingredients together and lay them on to a greased cookie sheet. Grill them on the top rack on high for 10-15 minutes. They should brown just a bit and cook but still retain some of their crispness. Season fish on both sides with salt. Combine mayonnaise, yogurt and lime juice. Brush evenly over fish. Combine all ingredients for the crunchy coating and dredge the mayonnaise coated fish in this mixture. 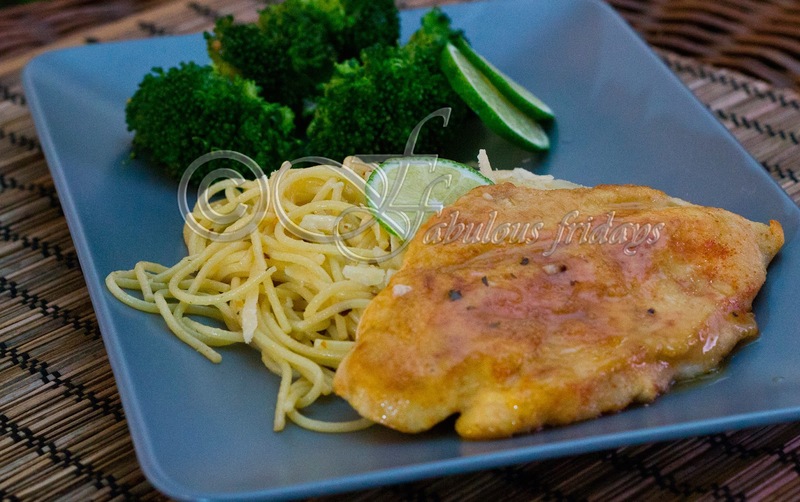 place fillets sprayed with oil in a broiler pan and bake at 450F for 12 to 15 minutes till fish flakes easily. Bring 2 cups water with salt to boil. Wash dry quinoa in a sieve till water runs clear. Drain and add to boiling water. Cover and simmer for 15 minutes till all liquid is absorbed and quinoa tender. Let cool. Finely chop pepper, onion and herbs. 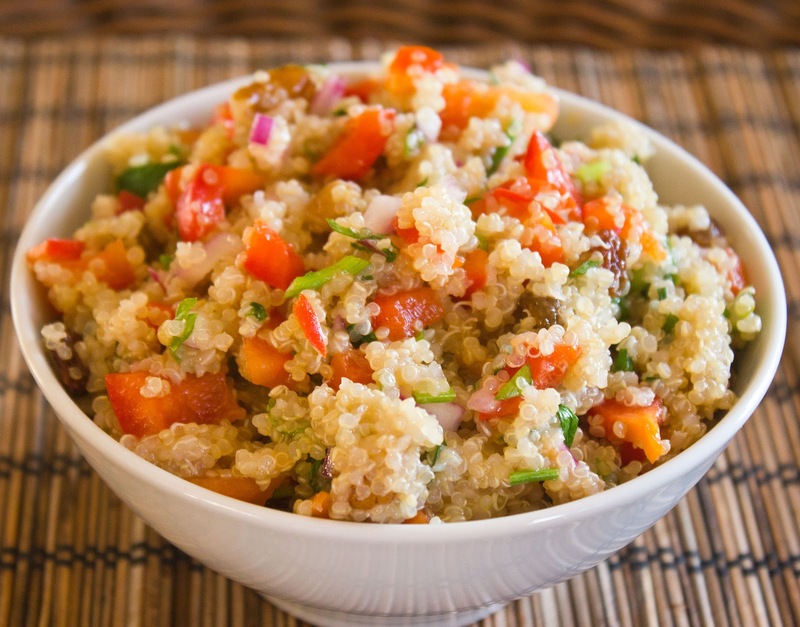 Stir in quinoa. Whisk all ingredients of the dressing together and pour over quinoa mixture. Toss to coat. Combine all the ingredients for dressing and stir well with a whisk. Combine all the veggies in a large bowl. Pour dressing mixture over it and toss gently to combine. Chill.